. Music is said to have begun from the sounds of the Universe, the Om. However, karnATik itself can be traced back to a time when there were no distinctions among the styles of music in India. Among the first music forms were the recitation of scriptures, including the Vedas (especially Sama Veda), which were originally performed with only three notes (ni, sa, ri), and later in 7 notes (400BC), in the raga kharaharapriya. The Vedas also described musical instruments. In the sixth century, the Brihaddesi first used the word "raga," and mentioned some popular ones. Caves at Pudukottai in Tamil nadu describe more ragas in the seventh century, and the Thevaarams and Divya Prabhandams at this time also described several paNNs. In the 12th century, Jayadeva's Gita Govinda inspired music and dance in his Ashtapadis, each in a different raga. Until the 13th century, classical music was similar or common across India. With the arrival of Moghul influences, Hindustani music and Carnatic music split into the two forms, the former incorporating the new influences and the latter retaining the original form. The Sangita Ratnakara described swaras, ragas, talas, instruments, and gamakas, and this work first used the word "Carnatic," but it wasn't until the 1300s that Carnatic music and Hindustani were clearly distinguished. Sangeeta Sara was also written in the 1300s, and first classified ragas as melas and janya ragas. In the 15th century, Arunagirinathar wrote his famous Tiruppugazh in Tamil. 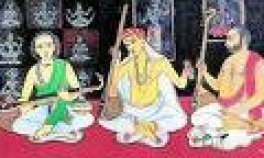 At this time, Annamacharya first described the musical form known as the kriti, which had a pallavi, anupallavi, and caraNam, and Purandara Dasa also wrote the varisais for musical exercise and geetams which are still used to teach beginners. 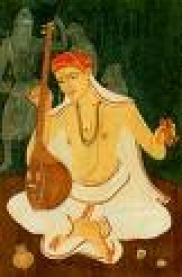 In the 16th century, Swaramela Kalanidhi described a further elaboration of melakarthas, ragas, and playing techniques for the veena. In the 17th century, Venkatamakhi created his 72 melakartha raga system, which used the katapayadi scheme. The Sangeeta Saramrita and Sangraha Choodamani were written in the 18th century. This was the century of the Trinity also: Syama Sastry, Tyaagaraaja, and Dikshitar were born.